How do rivers last so long in dry weather? I got caught in a downpour while climbing a mountain and was amazed to see, as I climbed down, the tiny trickles of water combine to form mini-streams, the dry rocks I had climbed up now hosted sizable waterfalls, and the path which I had followed to the mountain had become a small river. But it got me wondering about my question, which is the reverse of this. Why, after a long period of dry weather, are many rivers still flowing? I live near a river and it seems that it takes over a week of dry weather before there's any noticeable drop in its level. How does it not simply run out of water? Is it simply that it takes very a long time for the water at its source and the sources of all its tributaries to reach the point I'm observing from? It seems there's a constant supply of water when I would have expected the network of rivers to start draining, and the drying up starting from the source the moment the rain stopped. A river's primary of source of water is precipitation, surface water run off, and shallow groundwater discharge within the drainage basin the river is located. 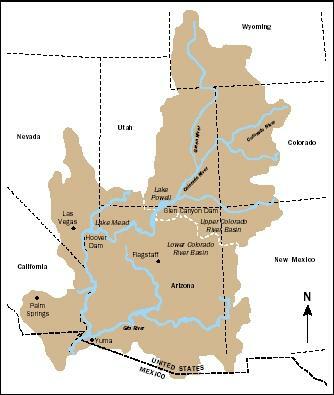 The size of the drainage basin really determines if a river may run dry during drought conditions. Some river basins are so large that drought conditions are unlikely to persist over the entire basin at any given moment. 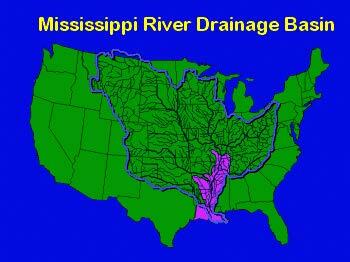 (See image drainage showing Mississippi River drainage ~1/2 of the US). With the Colorado river, scarce rainfall and over-usage leads to a greatly diminished flow at discharge into the into the Gulf of California (Sea of Cortez). Glaciars and snow in mountains act as natural dams for many rivers. That's why several rivers have an increase of their flow during hot times, when the snow melts and the river moves more water compared to other times of the year. Since many mountains keep part of their snow and glaciars the whole year, the rivers that start there will have water for a long time. Finally, snow that falls in mountains is by far more than the rain that falls in the valley below, so each rain you see in the valley is a storm up in the mountains. In exchange, rivers that depends heavily on rainfall are more prone to dry once the rain stops. Not the answer you're looking for? Browse other questions tagged geography rivers rainfall or ask your own question. Do rivers/creeks flow underground when they dry up at the surface? How do long rivers exist? What is the source of the Big Sur river? What is the temperature of the flowing water in icy river? Could parallel rivers flow in opposite directions?